You learn about a culture through food and religion. 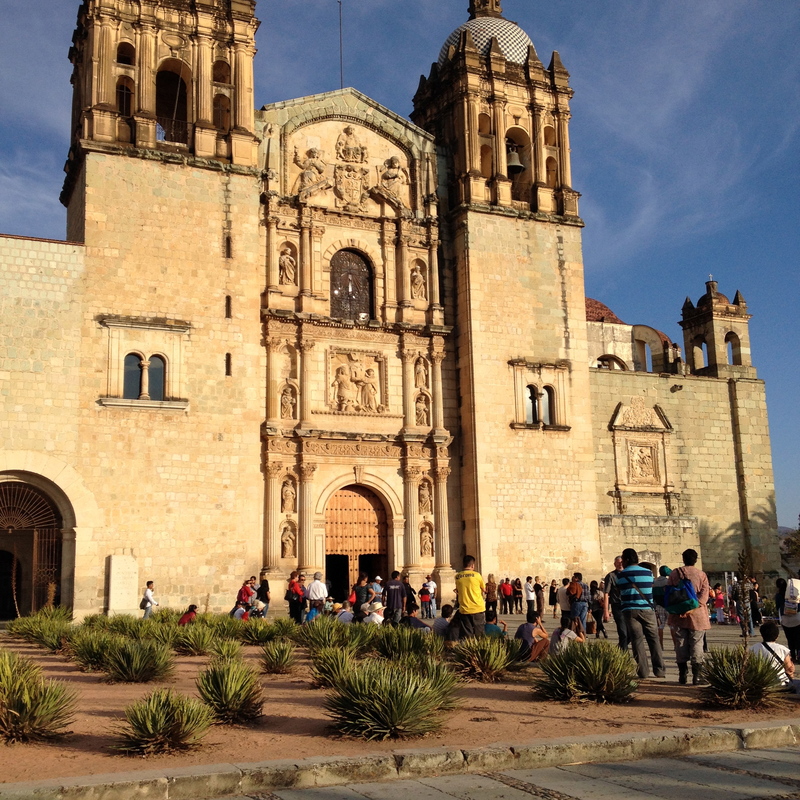 We continued our exploration of the cultural life of Oaxaca (“Oaxaca, a la vanguardia en cultura”) in markets and churches. 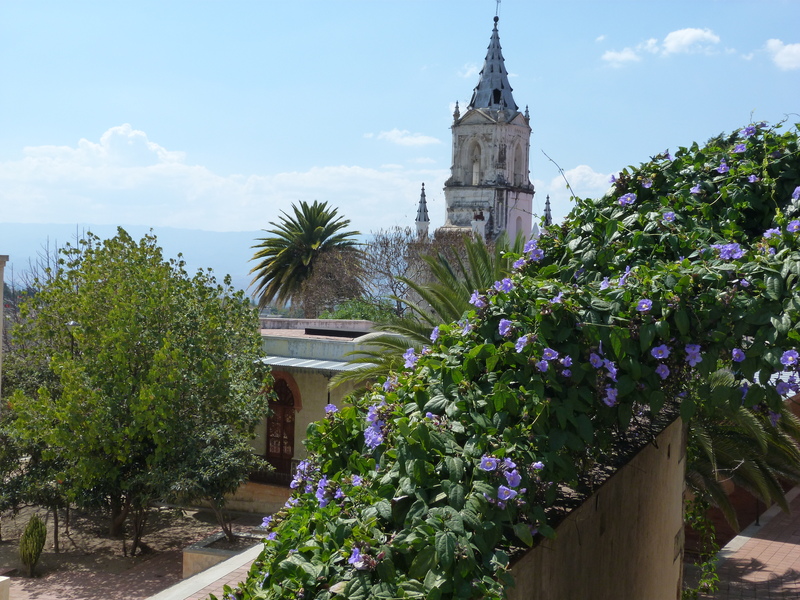 My guide book tells me that Etla is a county-sized region encompassing a number of villages, the centre of which is sometimes referred to as the Villa de Etla, or sometimes Reyes Etla, or as one guide book tells me should be more correctly called the town of San Pedro y San Pablo Etla. But everyone just calls it Etla. 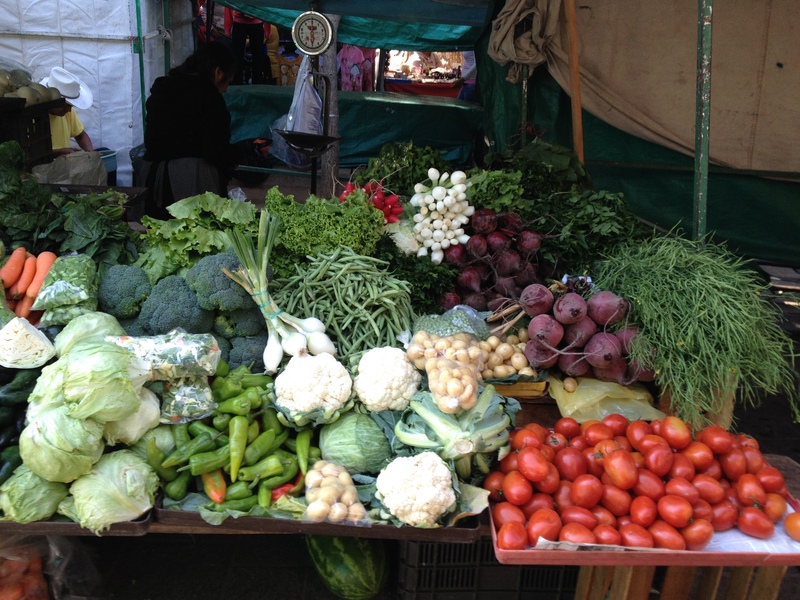 It is the site of a massive market on Wednesdays, selling produce, cheeses, meats, herbs, sheepskins, pottery etc. We went to the Etla market with our friend Lynda on a Thursday, missing the crowds and giving us time to enjoy a local desayuno (breakfast), a stroll through the market and a visit to both San Pedro and San Pablo. Breakfast was chiliquilles of several varieties. My breakfast tortillas were swimming in a mole sauce of dark ancho chilies, sprinkled with fresh queso and chopped sweet onion. I am not an egg person, so I opted for chicken, and was given mounds of gorgeous shredded chicken, which I swirled in the sauce. My mother and Lynda had green tomatillo sauce on their tortillas, topped with soft fried eggs. We cradled cups of fresh coffee and delicious sweet cocoa. Outside, just past our table, a woman sat on the ground tying together bundles of seed pods to sell alongside her roasted squash seeds and chilies. “They are Huaje seeds,” said Lynda, “The name ‘Oaxaca’ comes from the nahuatl Huaxyacac, which apparently means ‘the place of many huaje trees’”. The practice of gathering and selling the Huaje seeds has been going on for many centuries. The trees grow everywhere. Sated, we walked through the market. There were gorgeous breads, bright yellow chickens (one chopped open and proudly displayed with egg yolks still inside), cheeses, and people cooking quesadillas with ingredients I couldn’t identify. I bought a bottled chili sauce with chapulines (grasshoppers) and some chili powder ground with toasted worms. It’s the best powder for dipping slices of oranges and limes into, to have with your Mescal. It will definitely brighten up a dreary winter day in Canada! The town was filled with whizzing 3-wheeled vehicles. They are collectivos (shared transit) and they were transporting people to and from the rural areas around the town. 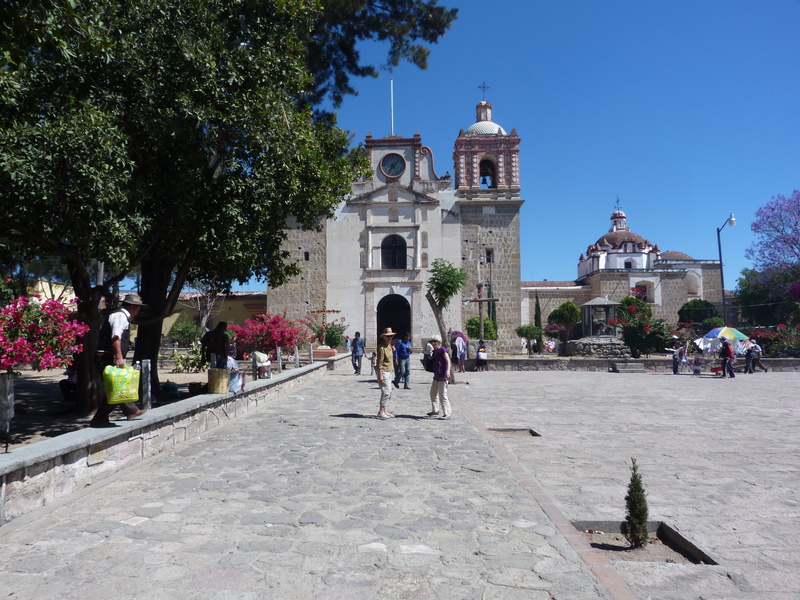 In the centre of town is the church and former monastery of San Pedro y San Pablo. The statue of San Pablo is in the courtyard. 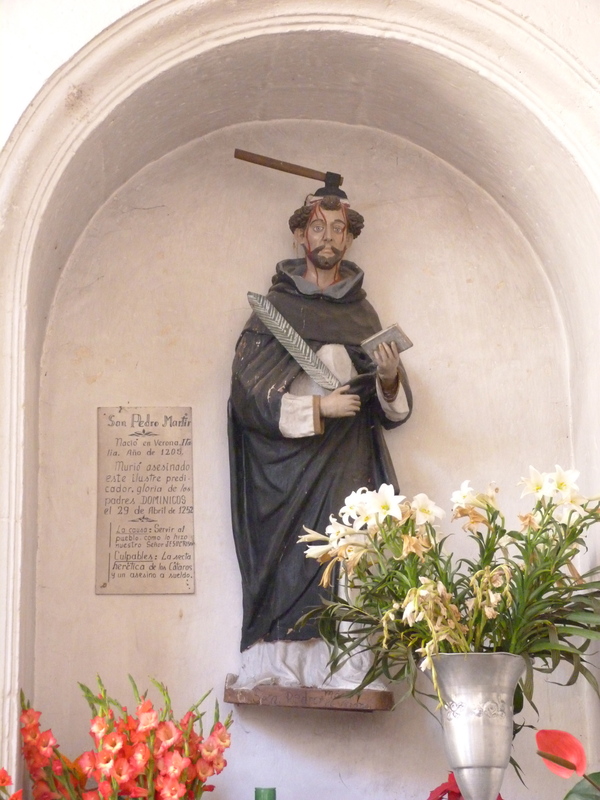 A 12th century Venetian martyr, San Pablo was assassinated on the road to Milan when someone put an ax through his head. He looks remarkably calm about it. 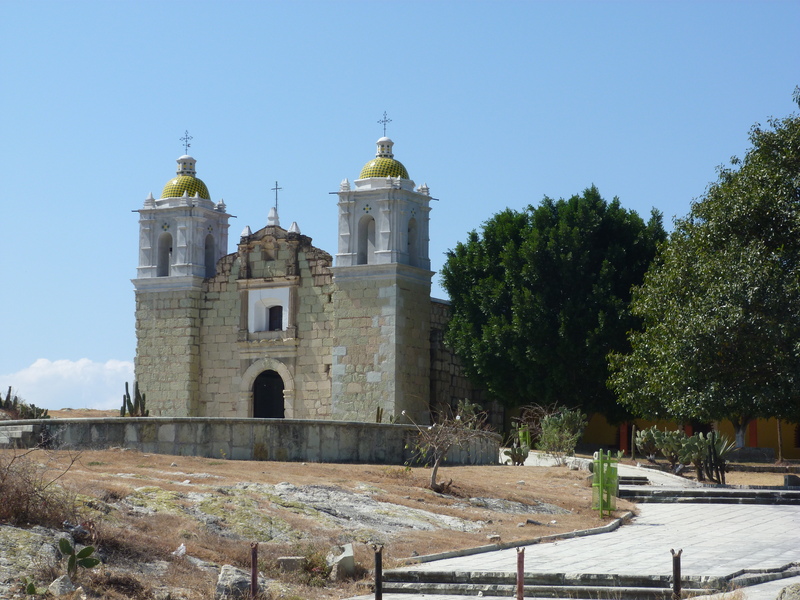 Less than 2 kilometres away, on the outskirts of the village, is the Santuario del Señor de las Peñas. Legend has it that when God was making the world, He sat down to rest here, and that the mark that He made has become petrified into rock (Peña). 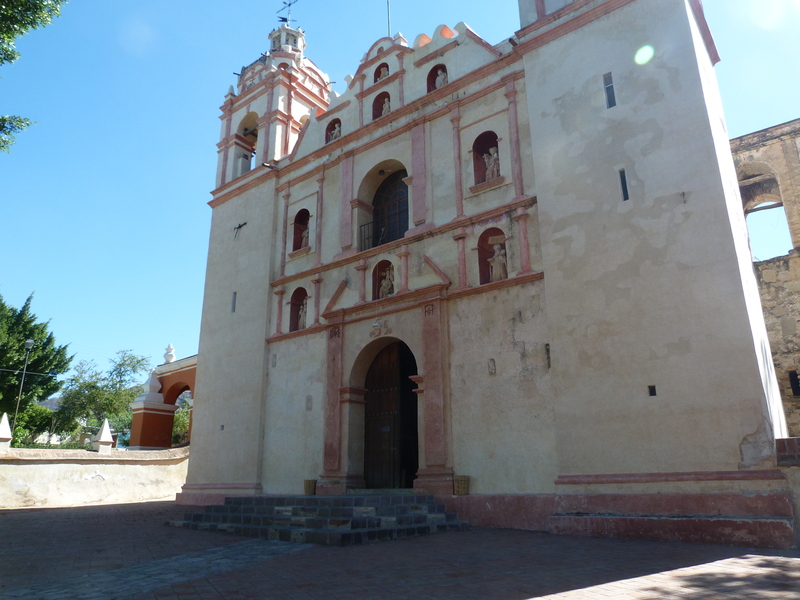 The chapel is built on an old Zapotec archeological site that has yet to be dug. It’s a magote – a hummock in the landscape that implies a pre-historic structure beneath. The Oaxacan valley is filled with unexplored magotes, overgrown evidence of a thriving culture. The chapel is a place of pilgrimage, where people go during Lent to be cured. 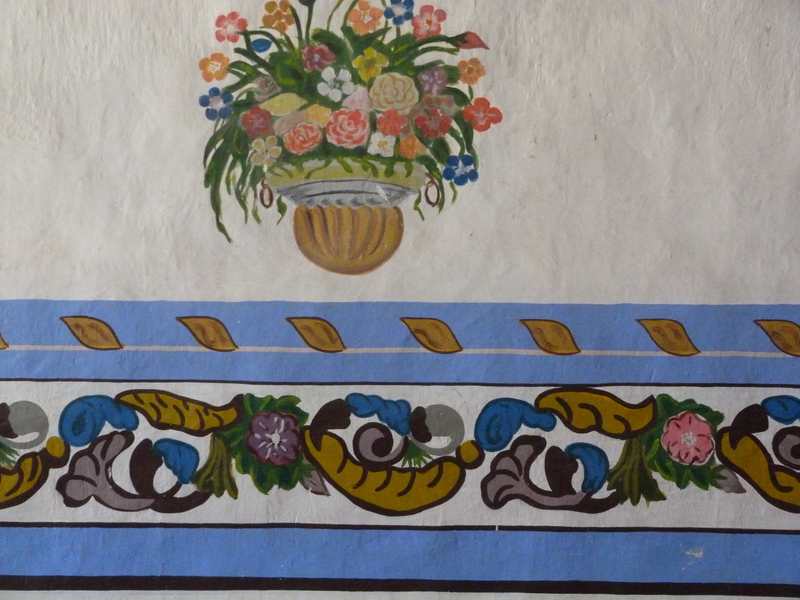 The church is filled with painted decorations, simplification of 16th century “white vine illuminations” commonly seen in Spanish manuscripts of the time. Here, though, they seem to be painted from memory, from a vague sense of what they must have looked like in the old world. A few kilometres down the road, in the village of Tlacochahuaya, is the massive Templo y Exconvento de San Jerónimo, one of the first Dominican Churches built in the new world, begun in 1586. A huge fig tree grows in the vast front courtyard. The yard was built to be large enough to hold 5000 people, who could be preached to in the open air. It was built with 3 open-air arched-roofed chapels or pozas where conversions took place. San Jerónimo still looks down on the courtyard below, his left hand on a skull, the voice of God coming to him through what looks suspiciously like a megaphone. Detail of San Jerónimo. He is in the centre alcove of the facade. 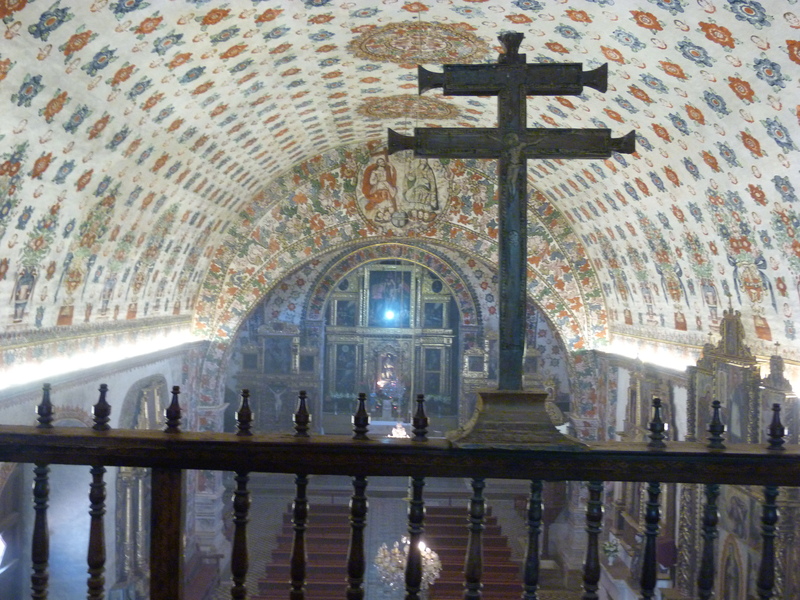 Inside, the Templo y Exconvento de San Jerónimo is filled with paintings of flowers and happy angel faces. 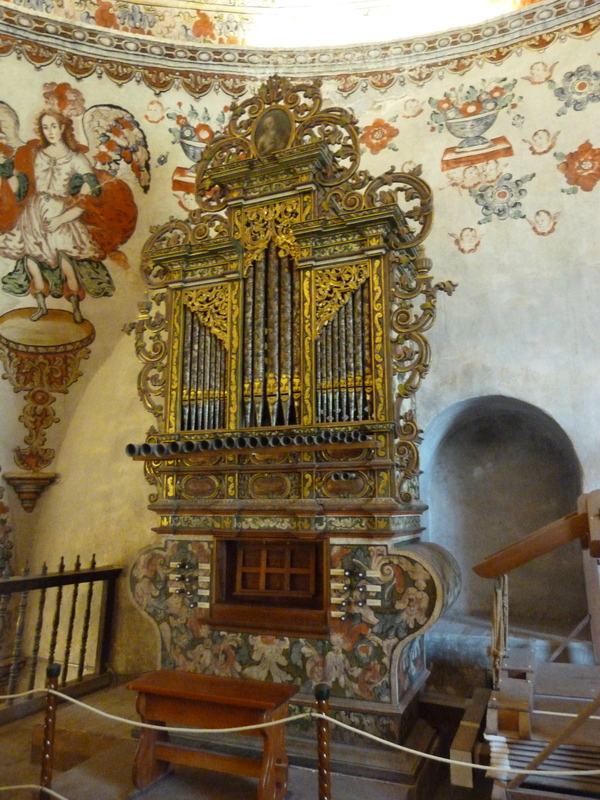 We were greeted by two men, one of whom spoke some English and offered to take us up to see the church’s treasured organ – for the price of 10 pesos each. 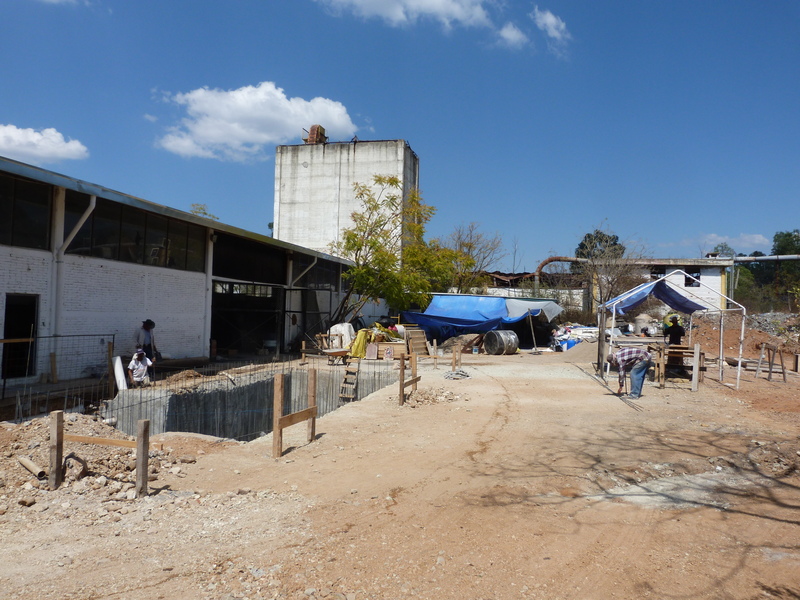 Andres lived in the United States for 30 years, working to support his family here in Tlacochahuaya. He wants to stay home now – his daughters have all married and he tells us, passionately, that he wants to stay in Tlacochahuaya with his wife. After 30 years of living away, we couldn’t help but wonder what his wife thought. 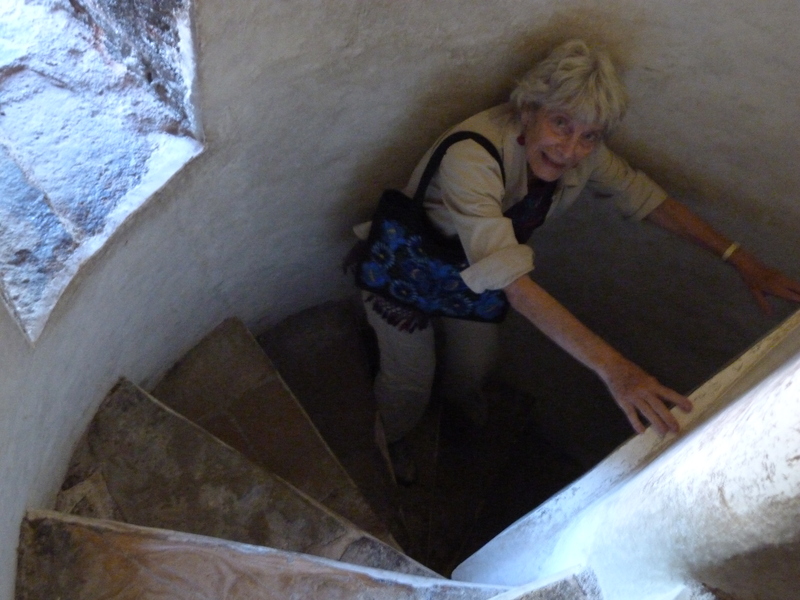 Andres unlocked a low door and we followed him up a narrow stone staircase to the choir stall above. 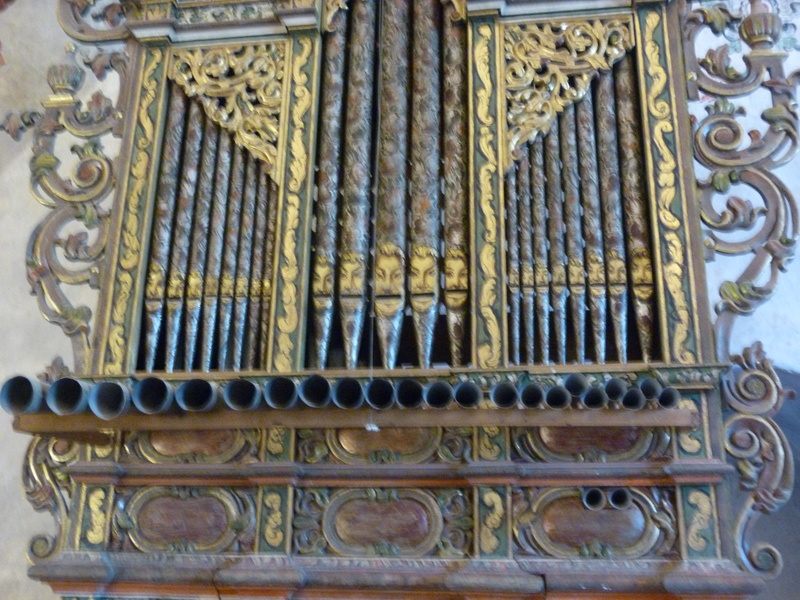 The organ is magnificent, covered in decoration, the pipes painted with wonderful faces and the stops hand lettered. It was build in 1789 and restored in 1991. The bellows look very clean and new. Being up in the choir stall afforded us a detailed view of the painted decorations, and an overview of the smoky church below. 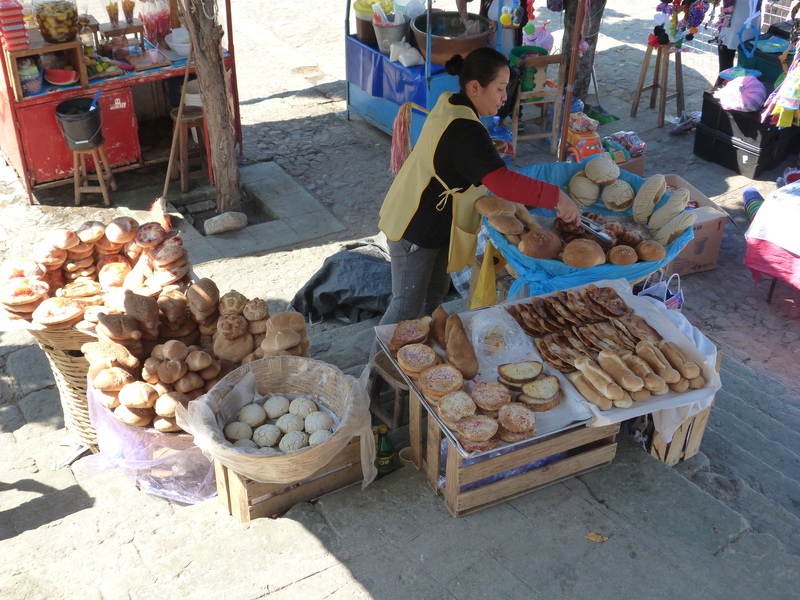 From Tlacochahuaya we headed to the town of Tlacolula and one of Oaxaca’s largest and oldest markets. 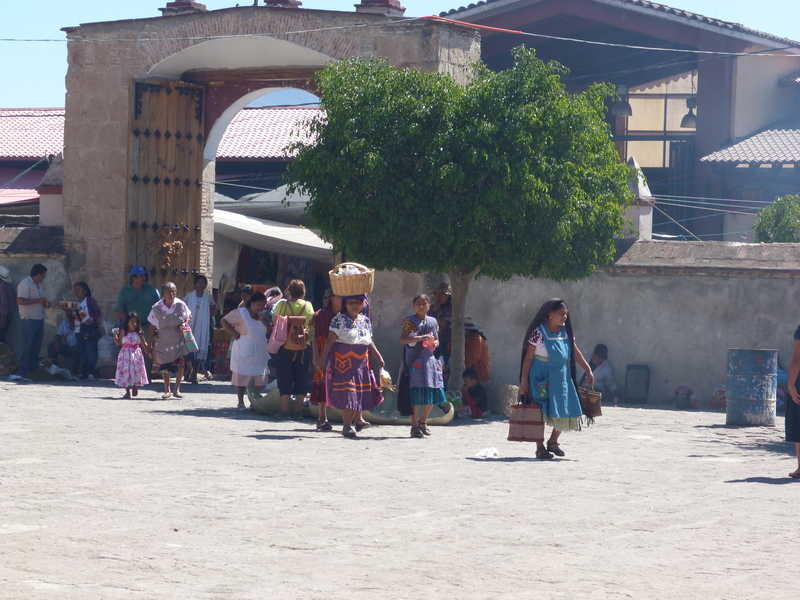 Tlacolula was founded by Zapotecs around 1250, and their culture still dominates here. 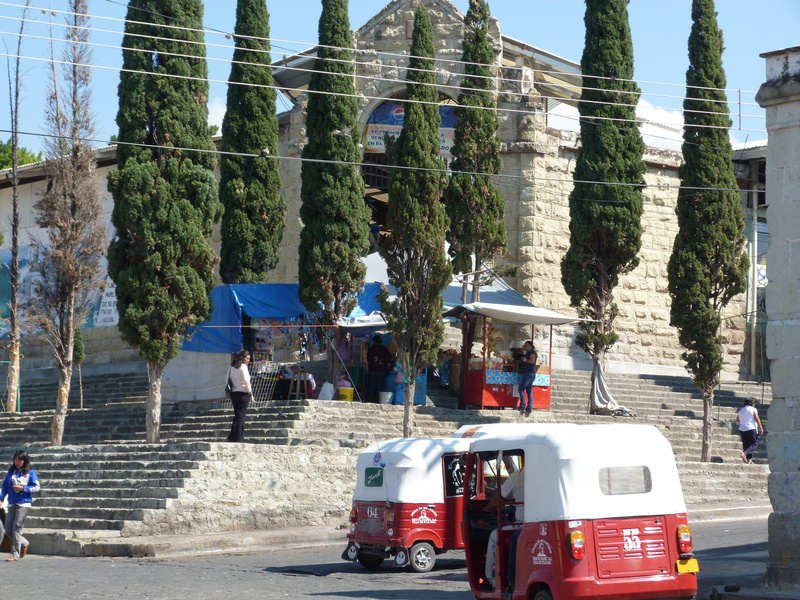 Originally called Guichiibaa (“place between Heaven and Earth”), Tlacolula has a population of 15000 – most of whom come to the Sunday market. We drove down the main street behind a Mexican cowboy on horseback, and oxen in yokes. A cow stood idly in the middle of the road. In the market, live turkeys and goats compete with stands of cheeses, chapulines, fruits, nuts, vegetables, breads, tortillas, Tlayudas, herbs and spices. I contented myself with a small package of toasted pipitos, squash seeds. We headed for comida at Comodor Mary’s, one of the oldest restaurants in the village. A photo on the wall shows people building the restaurant in 1929 – it’s been run by the same family ever since. 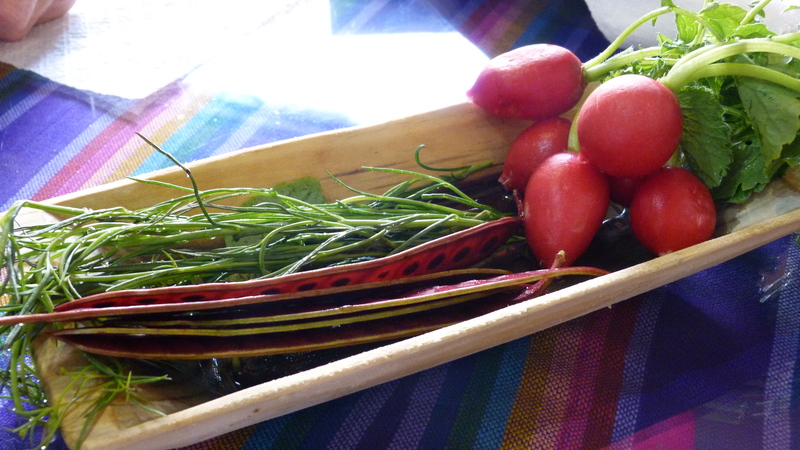 We were brought a basket of fresh radishes, Chepil (an herb used in molès, soups and salads) and Huaje bean pods. The beans, which I had been longing to sample since we were in Etla, were a bit bitter raw. Still, a fresh and interesting taste, and the radishes were the best I’ve tasted in my life. For my comida I had a perfectly cooked chili rellanos (chili stuffed with cheese), sitting in a sea of coloradita molès and refried beans. I sipped cold beer as I watched market women in brightly coloured clothing pass by with baskets on their heads. Beside the market is the Parroquia de la Virgen de la Asunción. It is lavishly decorated in carved ornaments, paintings and sculptures. Not one inch has been left bare. These urbane paintings and sculptures of Tlacolula were a striking contrast to the simplicity that we saw in the country setting of the Santuario del Señor de las Peñas. We headed to the chapel, Capilla del Señor de Tlacolula, which is known for its assemblage of martyrs who have died gruesome deaths. And it is here that I again found San Pablo. 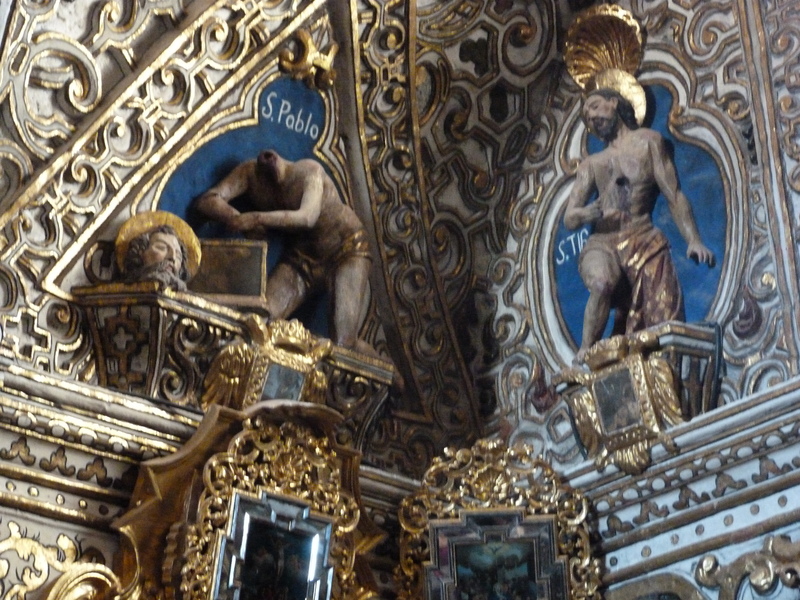 Amongst martyrs who have been shot with arrows, had their entrails pulled out, left with large holes in the bodies, San Pablo’s body leaned over calmly, his fully decapitated head sitting serenely below. I heard a soft sound behind me. A woman was weeping in a pew. I became aware of intruding in her space. I am, of course, a tourist, a gringa with a camera, insensitive to the sanctuary that this chapel offers to the inhabitants of Tlcacolula. 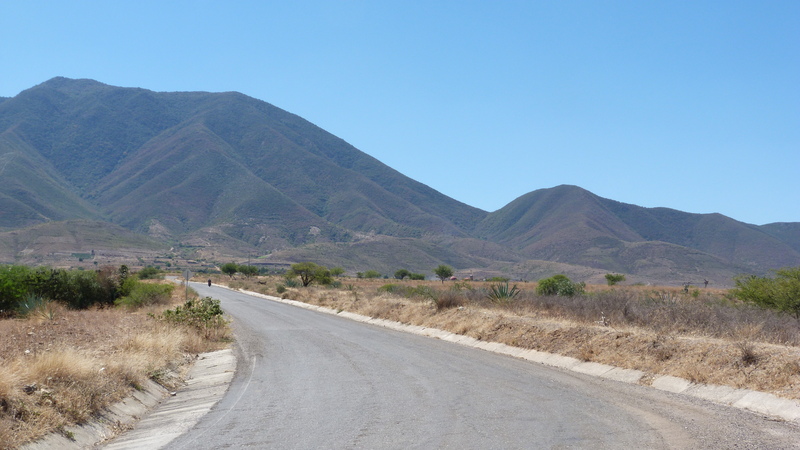 We left the vibrant colours and tastes of the Etla Valley and headed back to the city lights of Oaxaca. The statement reflects everything I have been experiencing this week. The state of Oaxaca blends a respect for tradition with an awareness of contemporary issues, politics and ecology. Rural towns specialize in indigenous crafts of pottery, rugs, alebrijes (brightly painted fanciful wooden creatures) and mescal, but the valley also houses artists of the new Mexico, whose work is exhibited in urban galleries. Within moments you can travel back in time, or leap forward with new approaches and creative solutions to new problems. Our friend Lynda Wilde is a photographer and writer who lives in Mexico during the fall and winter months www.lyndawilde.com. 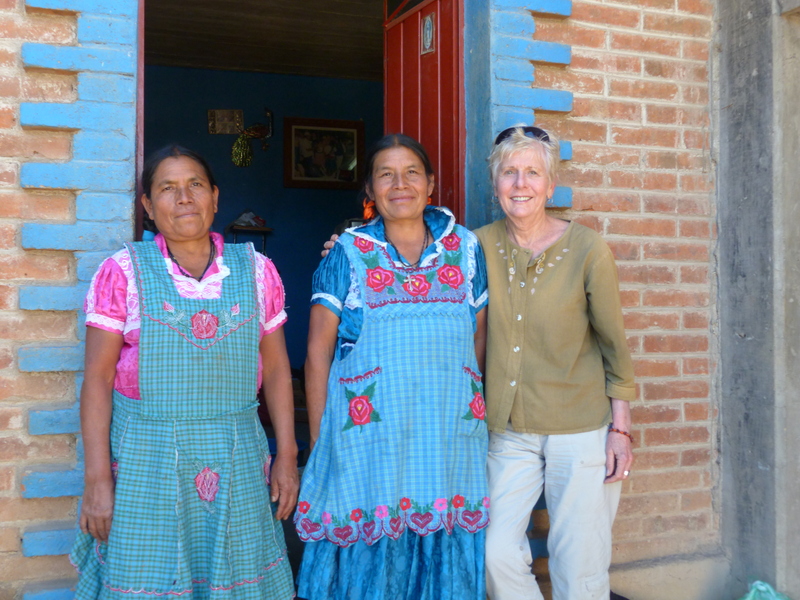 Lynda offered to take us on an adventure to discover some of the range of Oaxacan culture. 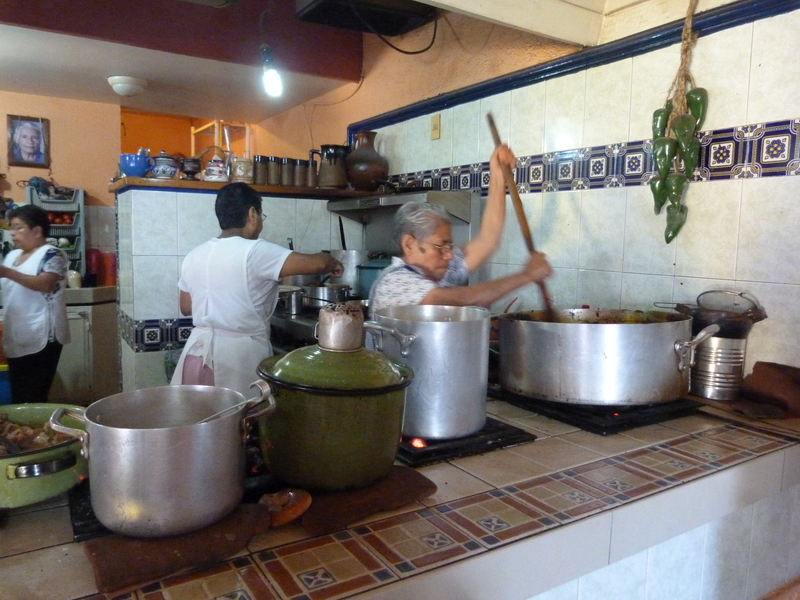 Our first stop was a tiny village three quarters of an hour out of the city, San Marcos Tlapazola, where she wanted to get a new cooking pot from los Mujers del Barro Roja. The signpost outside of Tlapazola lists the population as 1500, but I think that this may be generous. The village is tucked into the side of a mountain, as are many of the rural villages. An old reference book mentions the tourist Yu’u in Tlapazloa as a place to get a guide, and to stay the night. As we passed, it was clear that it has been deserted for many years – woe betide any tourist who heads there looking for accommodation! 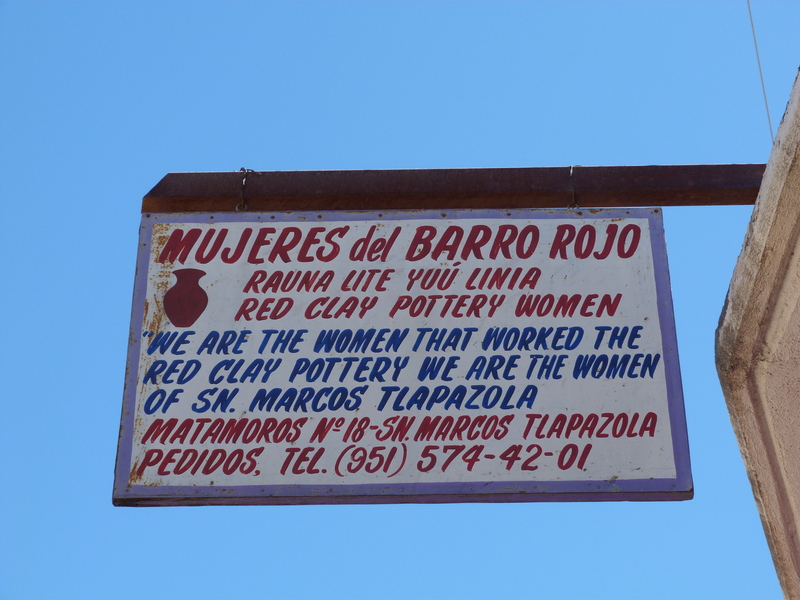 But in the heart of San Marcos Tlapazola is an extraordinary family of women – the Mujers del Barro Roja – who have been making extraordinary red clay pots, plates and jugs for several generations. The women work in a completely non-mechanized way, spinning their pots on pieces of leather stuck in the ground and firing them in a kiln coated with wood and donkey dung. Lynda visits them every year, and has made a film of their firing process. http://www.youtube.com/watch?v=6mpk_XcFPks When we arrived the women greeted her with great hugs and smiles. 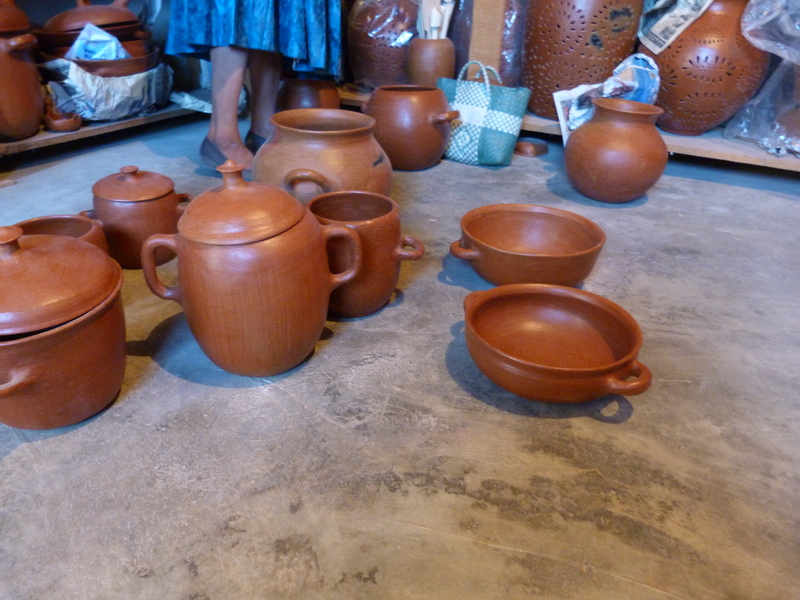 Their pottery is simple, elegant, light weight and incredibly functional. Polished and shiny, you can cook with them on the stovetop or in the oven. We sat in their small storage room and pulled pots from the shelves, comparing sizes and shapes, and searching to find lids that matched our favourites. If I weren’t flying home I would buy them all. I loved their feel and glow. The sister’s warmth and humour was infectious, their way of life honest and indigenous. Their beautiful elderly mother sat polishing a small bowl. A young niece worked over an open fire preparing comida. Chickens scratched in the yard. There are no men in their world, and they seemed entirely happy and at peace. With our purchases made, they sent us on our way with freshly made Tlayuda (a regional crispy, thin tortilla about 20” in diameter). 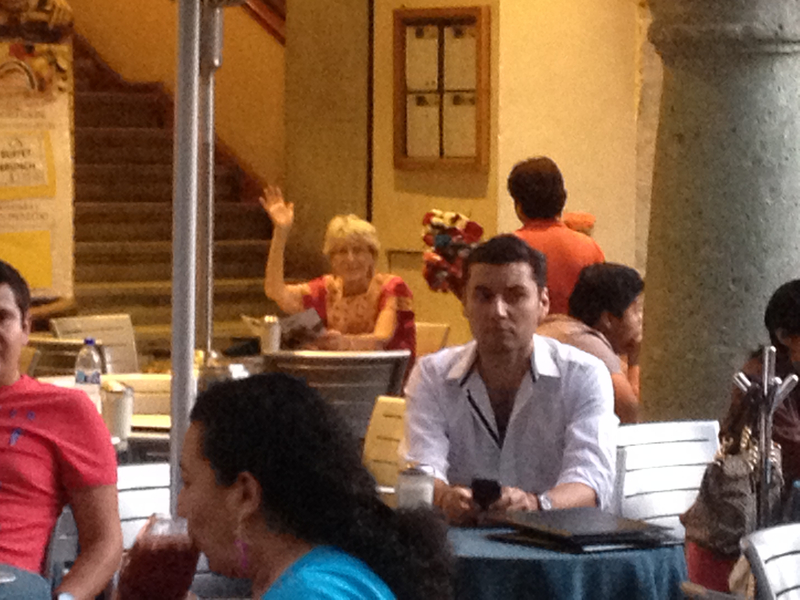 Lynda also wanted to show us the other, contemporary Mexico. 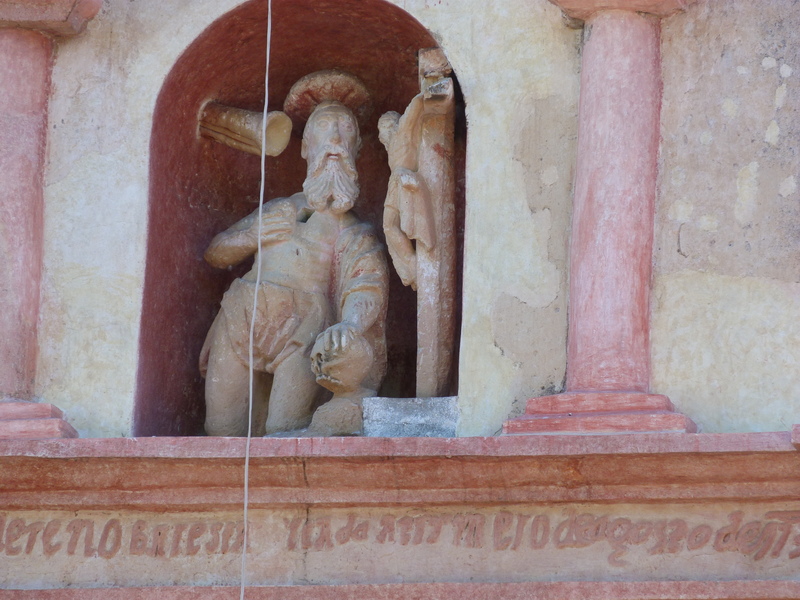 Any excursion into the arts of Oaxaca must pay tribute to Francisco Toledo. Toledo is renowned for his artwork and his encouragement of the contemporary arts of Oaxaca. He was instrumental in starting an art library at the Instituto de Artes Gráficas de Oaxaca and in founding the Museo de Arte Contemporáneo de Oaxaca (MACO). 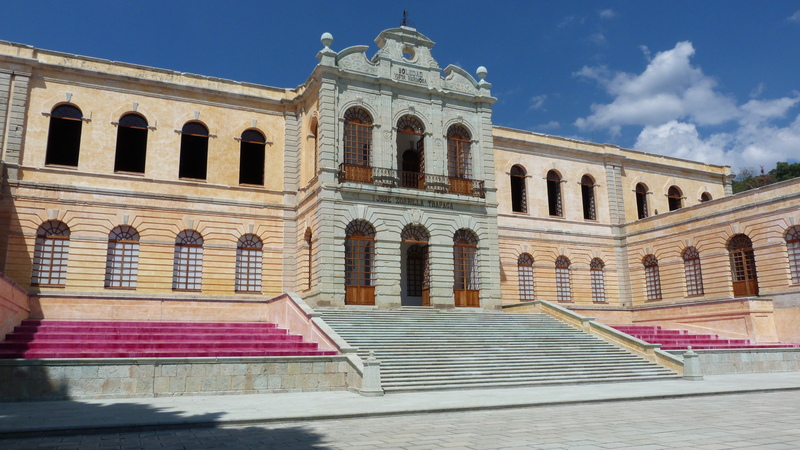 He was also one of the driving forces behind the Centro de los Artes de San Agustín Etla http://www.cenart.gob.mx/vida-academica/centros-de-las-artes-estatales/centro-de-las-artes-de-san-agustin-etla/. Founded in 2006, the centre is the first ecological arts centre of Latin America. Housed in a former spinning and weaving factory outside the small town of San Agustín Etla, it sits in atop Vista Hermosa, Beautiful View, looking over the valley of Oaxaca. The Centro de los Artes de San Agustín Etla was created to encourage training, experimentation and collaboration amongst artists in all disciplines. The classrooms, display halls, residences and libraries are an inspiration to national and international artists. The Vista is indeed beautiful, as are the renovated buildings of the centre. On the day we arrived, there were no classes going on, but we were able to wander through the facilities to our heart’s content. A new display showed us that the next phase of the project is to build a home for the study of mathematics, which to me seems thrillingly creative. There was also an exhibit of new work by Francisco Toledo– a wonderful show of drawings and watercolours created as an homage to Jorge Luis Borges’ fantastical animals. Ribald, sexual, surprising, the show revealed Toledo’s collaborative approach and incredibly artistry. A steady stream of water flowing down from the top of the mountain made the location ideal for the nineteenth century factory, and in the twenty-first the flow of water encouraged the creation of Arte Papel Vista Hermosa. 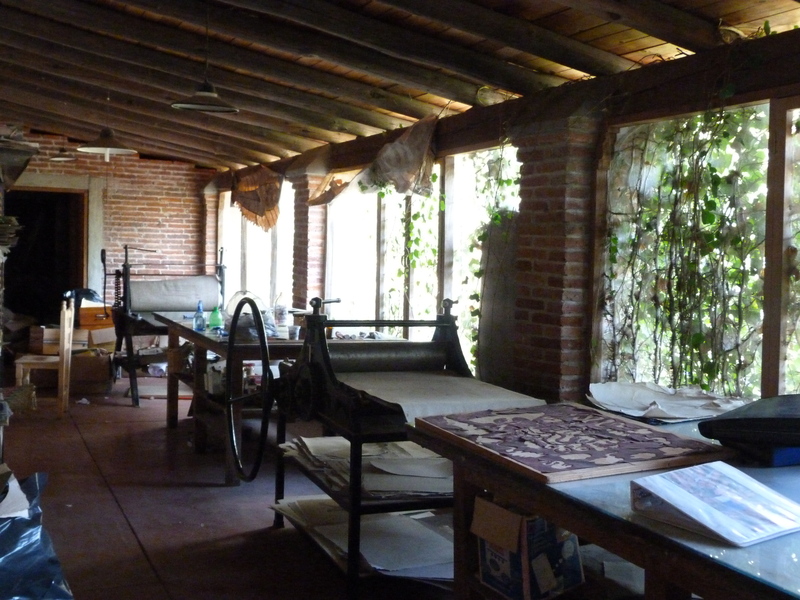 An artisanal paper making facility just down the mountain from the Centro de los Artes, Arte Papel encourages the use of natural fibers and techniques, using ecologically motivated production processes and contemporary artistry. The discipline and craft of the institute’s paper artists are reflected in the sheets of hand made paper and paper creations (jewelry, kites, hand bound books) offered for sale. Paper, I thought to myself, is easier to carry home than pots. We drove through a gate surrounding a number of sterile looking buildings. Walking through a yard of machinery and broken bottles we entered Xa Quixe, a Zapotec word meaning, amongst other things, “a time for transparency”. http://www.xaquixe.com/. Inside the factory we were greeted by Padro, who informed us that they were not blowing glass that day but we welcome to look through the showroom and factory. While lacking the natural scenic beauty of Centro de los Artes, Xa Quixe is equally inspiring in terms of artistry. Founded in 2002 by Salime Harp Cruces and Christian Thornton, Xa Quixe has a mission to produce original designs while being commited to environmental and social ideals. “Xaquite is a calling to a disciplined process manifested through creative action with fire and glass,” says the translated web site. The web site is a wonderful combination of poetry, imagery and information, blending Zapotec history with contemporary sensibilities. Standing in the slightly dusty showroom, I was hooked. 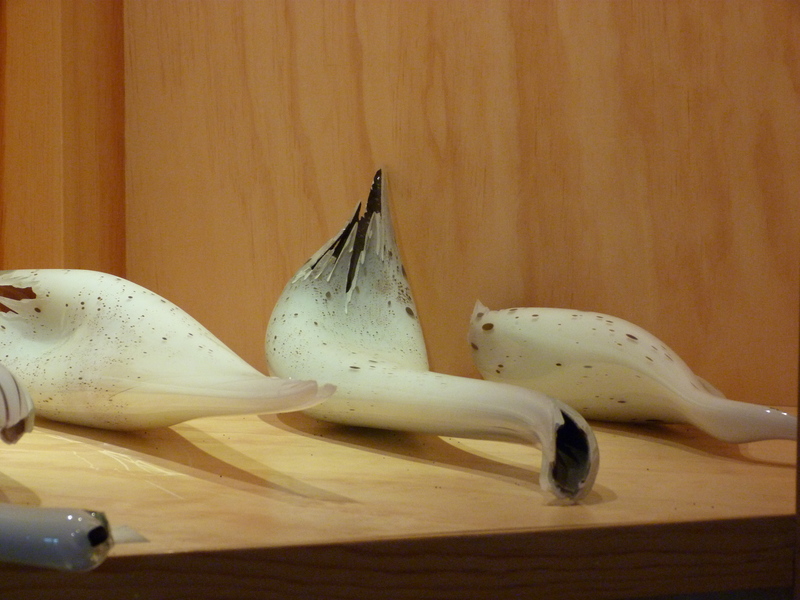 Sleek forms had been stretched into bird like sculptures. They nestled beside functional glasses in organic forms that begged to be held, admired and sipped from. And what a range of colours! The pieces were vibrant and full of life. 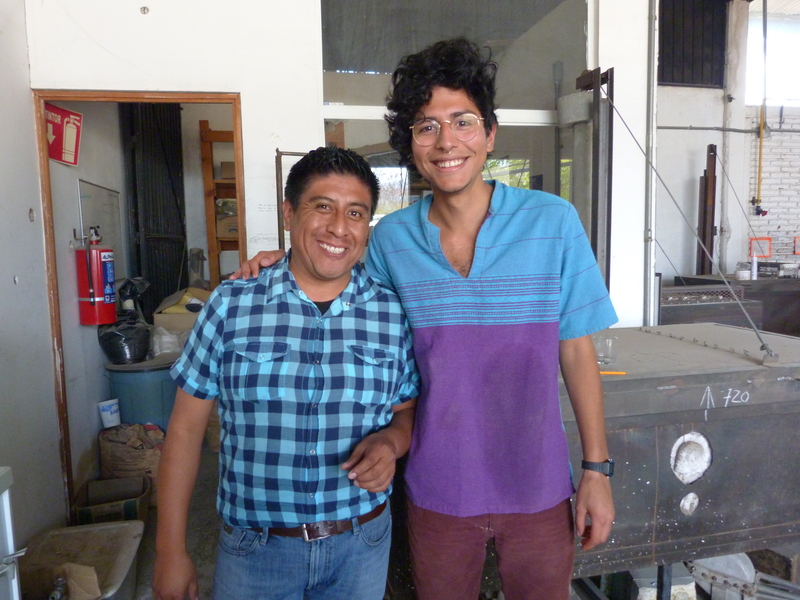 Padro introduced us to Salvador, who spoke fluent English – which was necessary in order for us to fully comprehend the innovations that Xa Quixe is undertaking. Environmentally conscious, he explained, they use recycled glass. Recycled glass doesn’t take colours well, but Christian Thornton has developed a new way of working, a new secret chemical process that allows their recycled glass to accept colour. Salvador also explained that a glass factory uses an incredible amount of energy – the furnace is constantly burning at 1300° centigrade. In order to save on energy, they have converted the furnace to use vegetable oil recycled from restaurants. They are able to get it to burn hot enough, and to have no bi-product. Looking forward, they know that there will be a huge competition for recycled oil, so they are working to develop a solar heating system. Solar? I ask. Solar up to 1300°? Yes. They think they are about 3 years away from that, Salvador says. Solar, plus an ecologically friendly combination of hydrogen and methane. Inspiring. Blending modern technology with ancient craft and social consciousness. Salvador and Pedro are people who bubble over with the love of their profession and their art. This was a new Mexico for me, a forward-thinking Mexico of innovation. Anyone who lives in our part of Canada will tell you it’s been a hard winter. 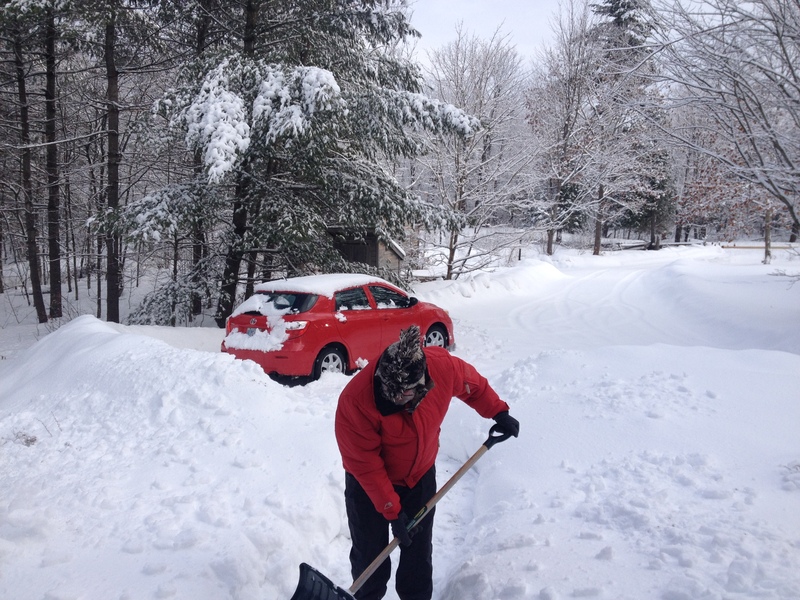 Long cold spells, mounds of snow. Not without its beauty, of course. We’ve had lots of opportunities to snow shoe and explore our woods. But I’ve escaped for a couple of weeks to an easier world, a world of colour and light. 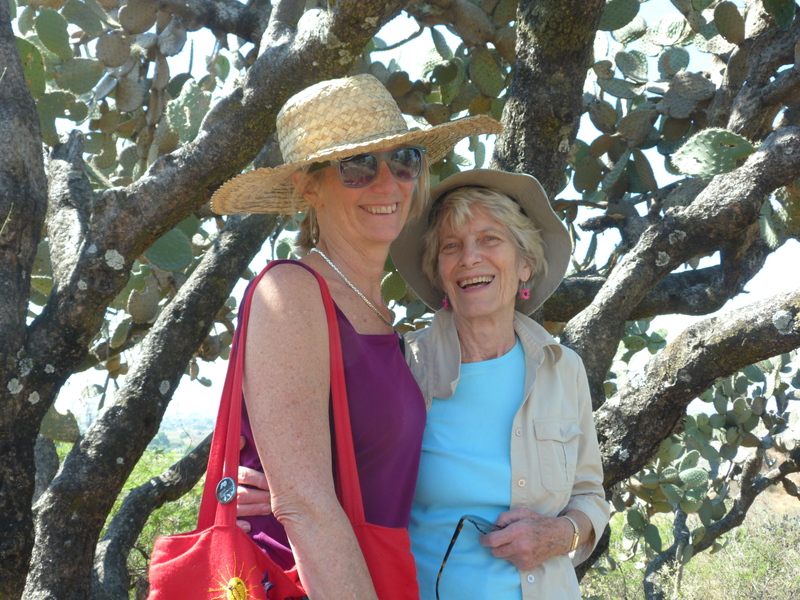 I’m visiting my mother in Oaxaca, Mexico, which has one of the most benign climates imaginable. Mornings of warm sunshine, just right for coffee on the patio. Hot at midday, but a heat that is easily escaped by moving to the shade. Cool in the evenings, perfect for long, air soaked sleeps. Every day predictably the same. The transition from Canada to Mexico is a jolt. My first days have been overwhelming, the sensory overload almost unbearable. Sounds, smells, colours everywhere. Soft breezes, warm sun. The beauty and struggle with language. The laughter and frustration, as I try to dust off old vocabulary. It is a gorgeous immersion. I started my first the day with a breakfast of quesadillas, made with soft corn flour tortillas, filled with black beans, Oaxacan cheese and squash blossoms, grilled over a wood fire. Sated, we headed to the market just up the street at Llano Park. The stalls sell everything imaginable: clothing and shoes of all varieties; hardware and kitchen utensils; toys and electronic games; fruits and vegetables; cheeses and meats; jewelry and makeup. Market vegetables. Note the size of the green onions! 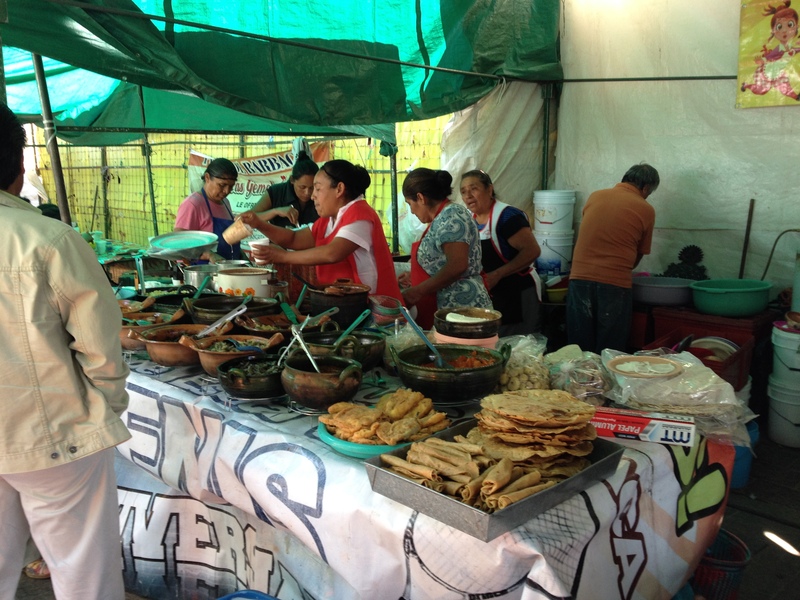 There are grills throughout the market where endless amounts and varieties of tacos are being prepared. 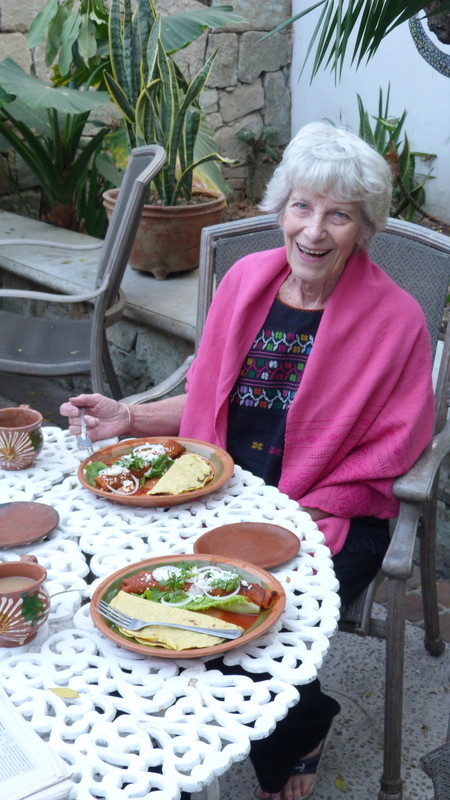 We walked long enough to work up a bit of an appetite, and rewarded ourselves with a plate of arranchera tacos – soft, tiny tortillas filled with shredded, grilled and chopped meat, onions, peppers, cheese. We topped them with fresh salsa and the most amazing blend of raw onions and hot peppers. Each plate has 3 tacos on it and costs 10 pesos, about 80 cents. We shared a huge glass of hibiscus water and were both stuffed. My mother invited me to join in her one-on-one Spanish class, where her teacher hugged me and thanked me for sharing my mother with her. My mother has that effect on people. The class consisted of a lot of hugging and laughing, my mother working on subtleties of the subjunctive that I don’t understand in English, let alone Spanish. I signed on for some private sessions next week, if only just to exercise my brain, wondering, as always, why I didn’t do this sooner in my life. A poster caught my eye. 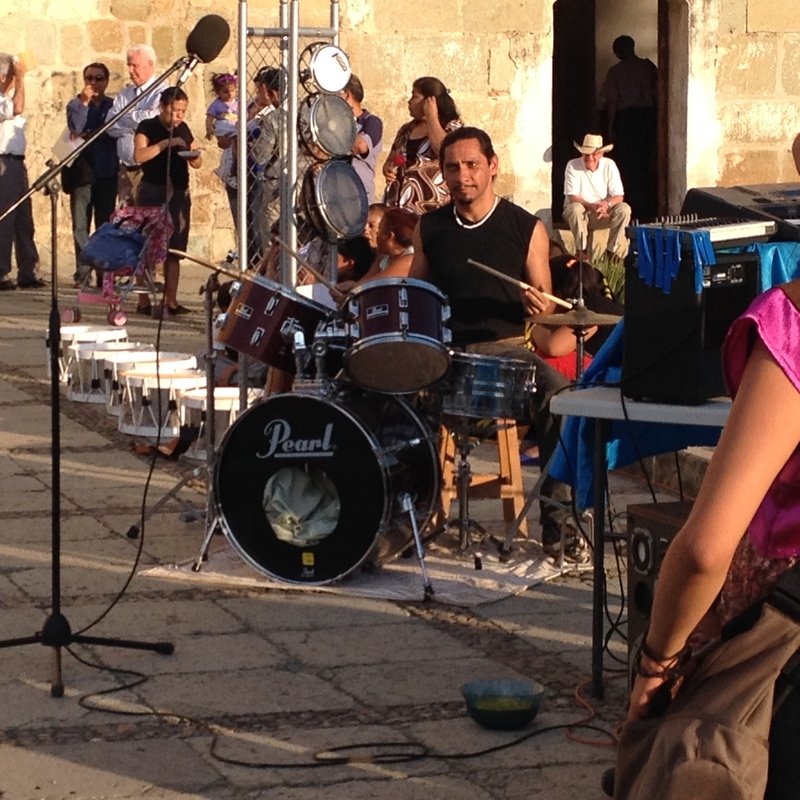 There was to be a performance on the atrium of Templo Santa Domingo. Viva la Vida, it was called. It seemed to have something to do with dancing and watermelons. Of course I was intrigued. So at 5:00, as the sun was just hitting the front of the church, we assembled to await whatever adventure would befall. 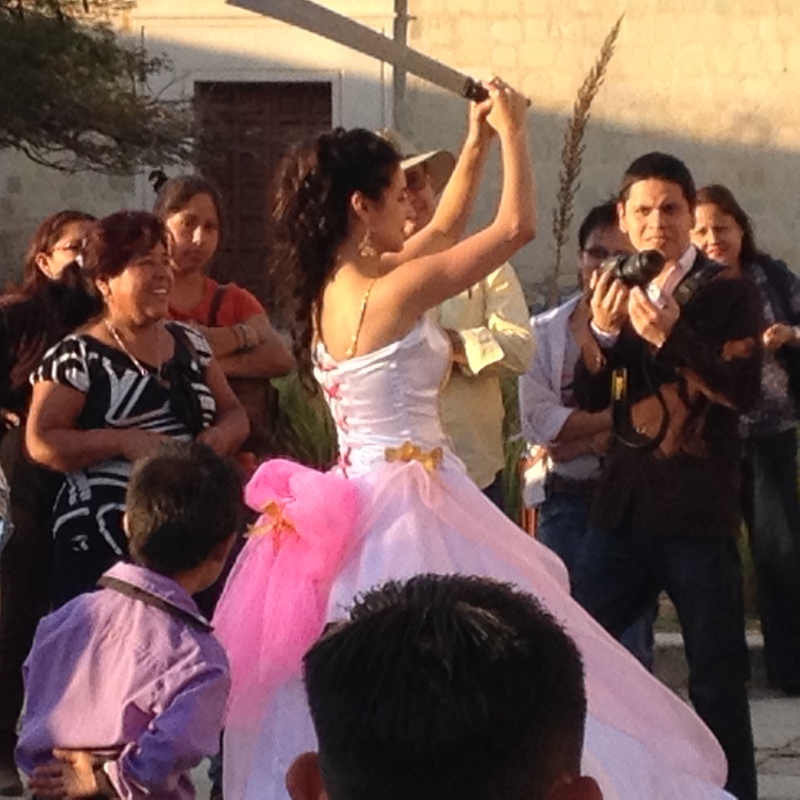 A program told me that I would see pre-Hispanic rituals, religious symbols and images from the fiesta de Quinceañera, a celebration for girls when they turn 15 years old. I also was reminded that the title comes from a work by Frida Kahlo. Sounds interesting, I thought. I was open to whatever was to come. Hundreds of spectators milled around, with cameras at the ready. Eventually a space cleared. A drummer and keyboard player played something that was vaguely liturgical and a woman lay prostrate in front of the church. 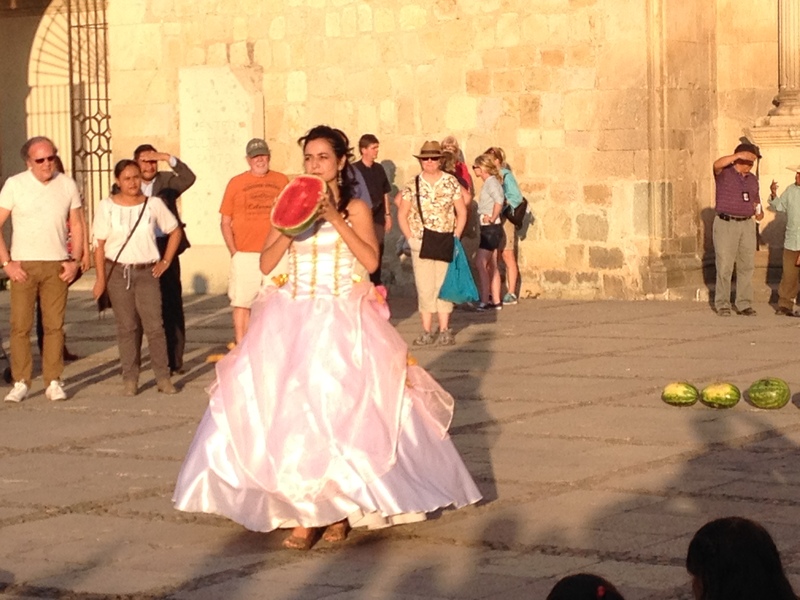 Suddenly about 25 children ran into the space carrying watermelons and they began to run in formation with the woman. Then they set the watermelons down and it was time for a costume change. The crowd waited, the sun moved down the church façade and the drummer did a 15 minute drum solo. When the woman finally reappeared, she was wearing a wedding gown and wielding a very sharp machete. She was inches from me, looking quite menacing, the knife clanging and creating sparks as she whacked the flagstones in front of me. This is not something we could do on a Canadian stage, I thought. Health and Safety standards would have protected me. The musicians played something that sounded vaguely like Pink Floyd. The woman picked up a watermelon and held it high before splitting it open with the machete. She gouged out the red flesh and began to wolf it down carnivorously, the seeds splattering her dress. Holding a fresh chunk, she then circulated through the crowd offering portions as a kind of perverse communion. On it went. Watermelon pieces passed to the children, to the audience. Music and vague menace. 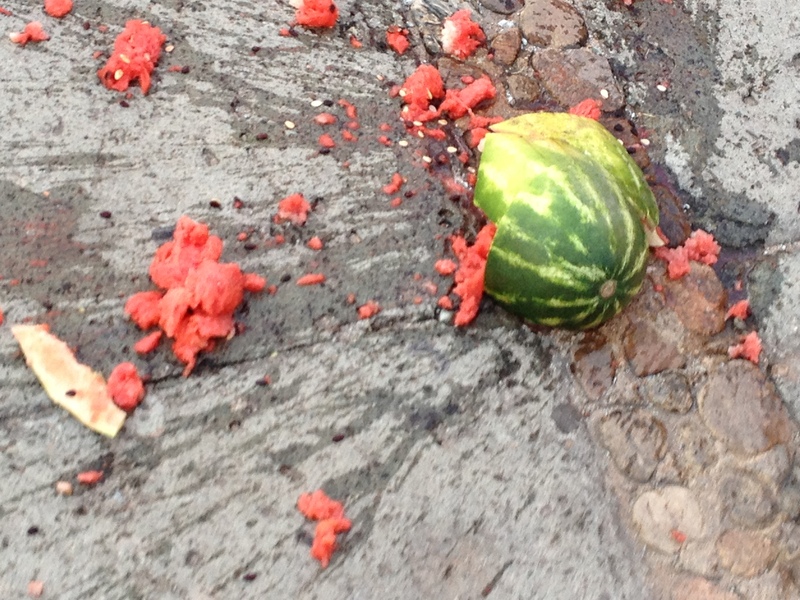 Then the woman raised a watermelon high in the air and smashed it on the flagstones. This is what I had been waiting for! Smashing watermelons. At least 30 of them! Mexicans never waste food, so the throng dashed forward to rescue what they could. Photographers swarmed like paparazzi. I have no idea if they were part of the performance, or just part of the audience longing for a spectacle they could record. 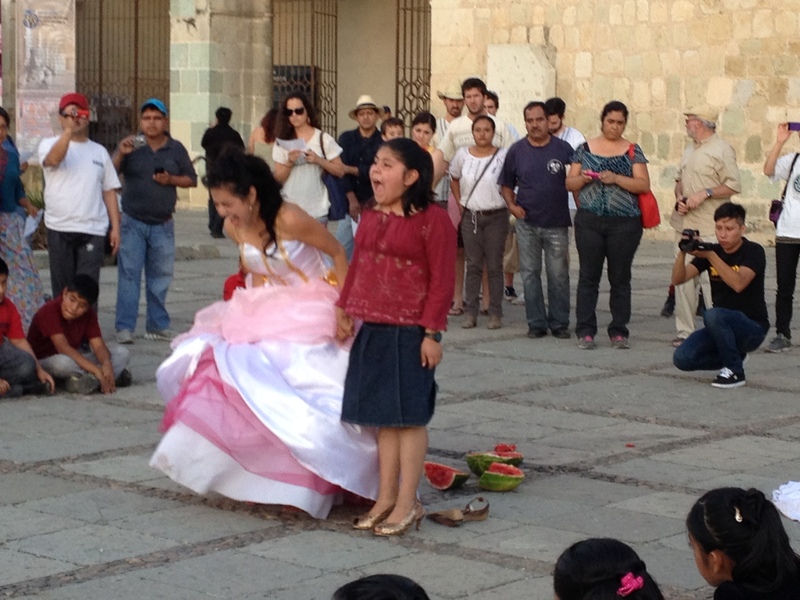 Spent from her watermelon frenzy, the woman again lay prostrate in front of the church in her soiled wedding gown. Then she sat up and was joined by a young girl. The woman took off her golden shoes and put them on the girl. Then they both stood up and screamed. They screamed at each other, they screamed at the church, they screamed at the crowd. Surely this is the end, I thought. 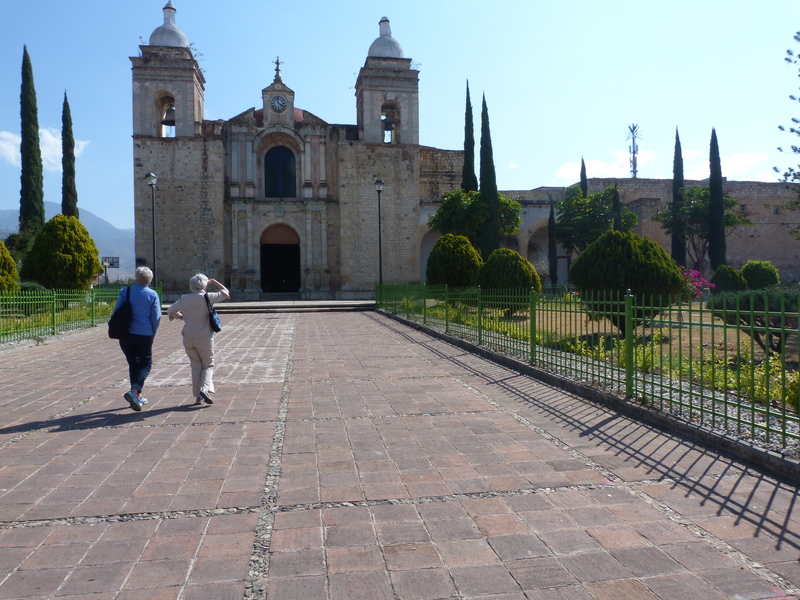 The sun had left the Churchyard and we began to feel the pull of the downhill walk to the Zocalo, to a glass of chilled wine and the happy contemplation of the universe. We turned from Viva la Vida, from costume changes and drum solos and plunged ourselves back into the world of un-programmed surprises, of street musicians and performers, of families joyfully reuniting after work and school, of shy young lovers snatching a few moments together, of tourists buying brightly coloured hats and rebosas that will look out of place in Minnesota, of ancient indigenous beggars with outstretched hands hoping for a centavo. Sometimes art cannot hope to compete with life.